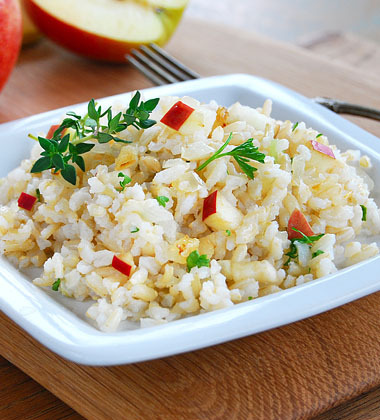 For a versatile menu option, this flavourful pilaf with sautéed onions and apples can be served as a main or side dish. 1. Sauté onion in vegetable oil over low heat. Add brown rice and stir to coat in oil. Add chicken broth, water, thyme and pepper. 2. Bring to a boil. Reduce heat, cover, and simmer until rice is tender, approximately 40 minutes. 3. Remove from heat and stir in apples and parsley.